Hey guys! It's Tuesday again! That calls for another Twinsie Tuesday post. This week's theme is Interlocking nail art. 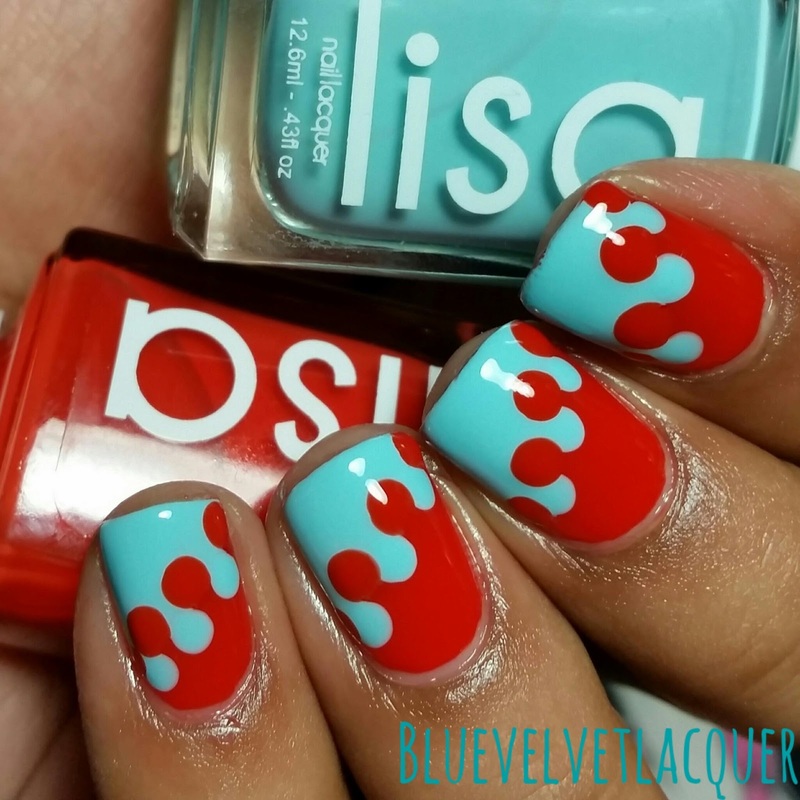 I'm also using this opportunity to swatch and review some Lisa Nail Lacquer! Check out what I did down below! Lisa from Lisa Nail Lacquer asked me to swatch for her and I was pretty excited because they're a new brand, to me at least, and I love trying new brands! And let me tell you, I was not disappointed with these. The formula was amazing plus they're 4-free and vegan! Let's get to the swatches first. Beach Bonfire is a hot orange leaning red jelly. This polish is part of the Summer Love Collection. I used three coats plus top coat for the swatches below. It was kind of sheer at first, but it built up nicely. Plus it was so smooth and not even streaky on the first coat, or any coat that is. This was so hard to capture though! It's way more orange than it's showing, my camera just kept capturing it as red. Island Breeze is perfect baby blue creme. I used two coats for the swatches below. This polish is part of The Perfect Pastels Collection. Sorry about the weird lines around my cuticles. I'm using the last bit of my top coat and it's getting kind of gooey. So it has nothing to do with the polish. The formula was amazing! It went on so smooth. Plus it's so pretty! Overall, I'm really impressed with this brand. The formula and application on both was flawless. They went on so smooth. I honestly could have gone without a top coat, but you know, habits. 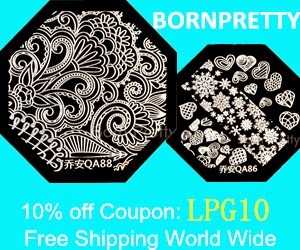 You can purchase these for $7 each by clicking here. Make sure to follow them on Twitter and Instagram! 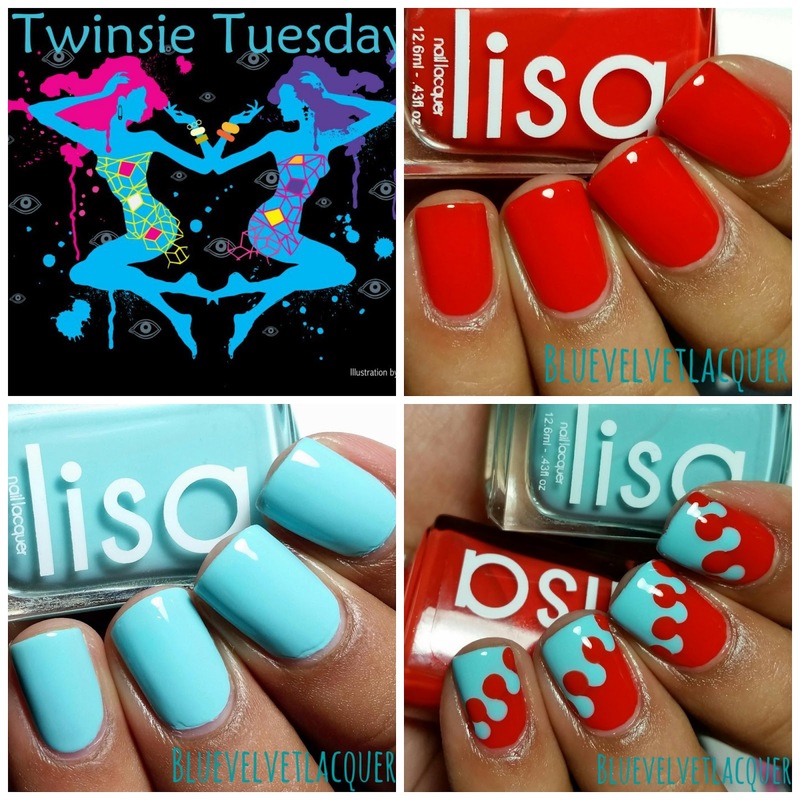 And here's my design I did using both Lisa Nail Lacquer for my Twinsie Tuesday prompt. I was rather surprised on how much I liked this design. To be honest, I've never done an interlocking design because I don't really like them. But they're rather fun to do and they look quite nice. Plus, it's so easy! I hope you guys like it! Let me know what you think down below! Also, check out what the rest of the girls did using the links below. You won't be disappointed! I'm blown away by the simplicity of this! The color combo is so unique and one I've loved since Essie released Mint Candy Apple with Lollipop for a holiday duo a number of years back. Amazing. Very nice! I haven't heard of this brand before but the bottles are cute. The red and blue go so well together! Really nice interlocking design. These colors are perfect together and the look is flawless! oh wow these colors are awesome! i neeeed that blue! Cute! I was really impressed with her formulas as well. That color combo!!!! It's really pretty. These polishes look really pretty!